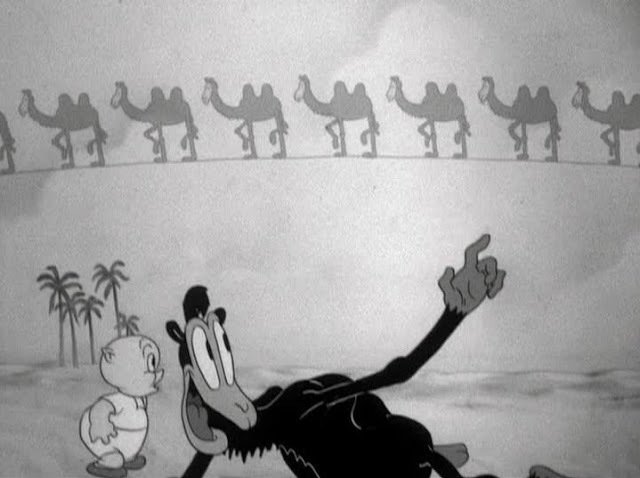 PORKY IN EGYPT (1938) --- Porky's camel goes mad in the desert (We'll rot and become bones --- white chalky bones! ), apologizes for it later. 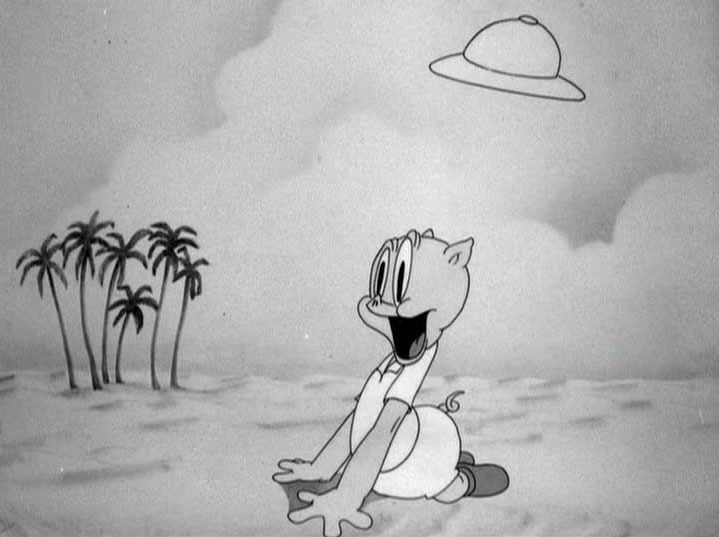 This is another Bob Clampett masterpiece. He said later that being stuck with black-and-white Pig subjects was a dead end, but none of malaise shows up on screen. Clampett and crew must have gone to see movies like Under Two Flags largely for purpose of mercilessly spoofing same in their cartoons. Porky In Egypt copies atmosphere and establishing shots of features done serious, then demolishes all their clichés. How could audiences go on taking desert romance seriously in the face of Clampett/Porky undermining? In fact, that sub-genre would begin fading with the 40's, save further mockery (Bob Hope's Road To Morocco camel spits in his eye). 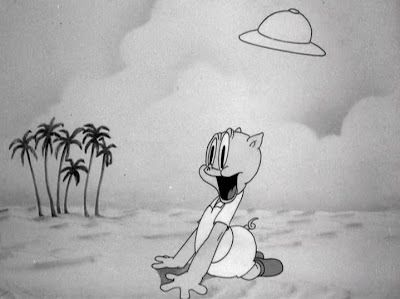 Warner cartoons were the whoopee cushion beneath Hollywood convention. SHADOW OF DOUBT (1935) --- Players sometimes had more rewarding work in B mysteries than elsewhere, like here for Virginia Bruce, Isabel Jewell, others who are woven into Ricardo Cortez's quest to clear himself of murder implication. 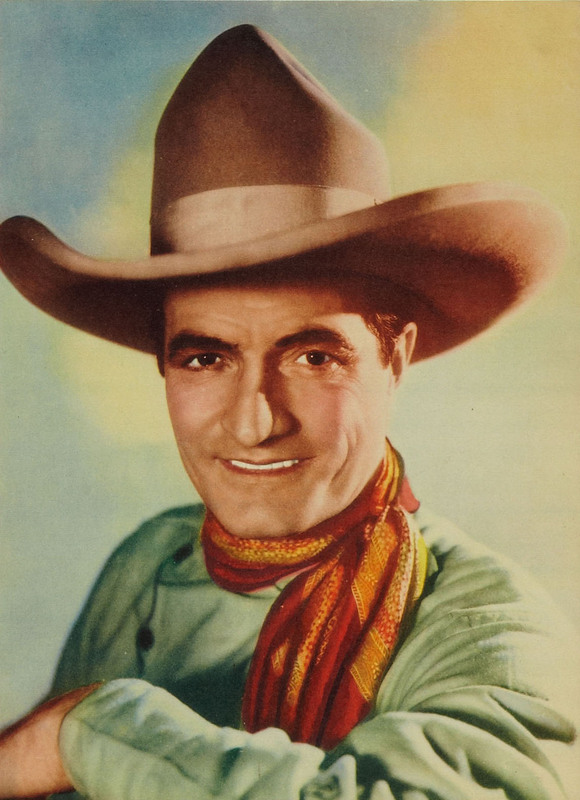 This came at start of MGM's official embrace of low-budget picture making, theirs a reluctant accommodation to double-bill policy theatres nationwide were instituting (including Metro landlord Loew's Inc.). 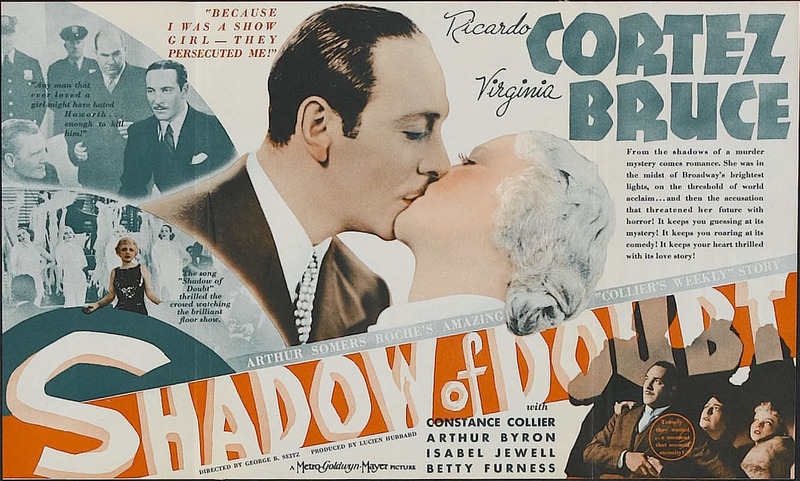 I guessed wrong about the killer's identity and that scored points for Shadow Of Doubt, another of seeming endless mysteries made to balance bills and send patronage home at least reasonably satisfied. Available from Warner Archive. 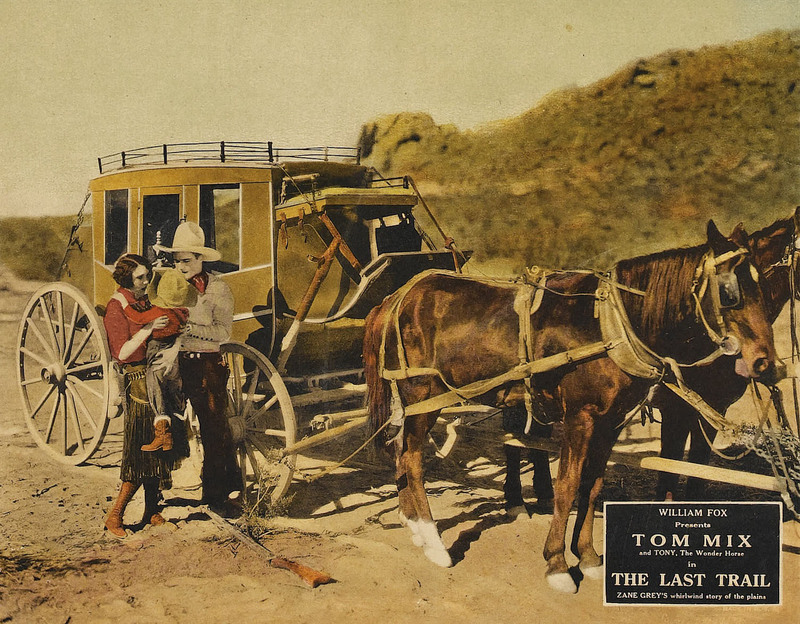 THE LAST TRAIL (1927) --- Tom Mix slaps leather for Fox Film Corp in what I assume was a no better-worse vehicle from his late silent period. The Last Trail, like all of Mix, scores on pell-mell action with Tom the bulls-eye who'll cede not to stunt doublers. If this is what they paid him $17K a week for, then a money's worth was undoubtedly got, for I can't imagine any cowboy surpassing TM in terms of speed and real-life embrace of danger. Mix was for families, not just kids, his Fox output grossing up there with super efforts unspooling at palace sites. The Last Trail is among ones that paired Tom with pint-size orphan charge, never a device to enhance action or interest (at least on my part), but essential to revolving formulae he'd embrace almost to the end. Now that Tom and most of his audience are gone, what's chance of The Last Trail and others like it being revived? THE DENTIST (1932) --- By most reckoning Bill's best short for Mack Sennett, The Dentist still startles for Fieldsian misanthropy as practiced on every character throughout its two-reels. No forthcoming Fields feature could have sustained such unrelieved nastiness on his part. Bill really let his hair down in limited length subjects where overall character impression was less important than piling up laughs. He could also embellish routines from vaudeville known to work. A shaved golf act (on a real course this time) gives way to brutal drillings by Dr. Fields, a femme patient's long legs wrapped round him to highly censorable effect. That last got gasped guffaws and put The Dentist among most-talked about comedies of an already rich season. Too bad was the falling out Bill had with Sennett ... more along The Dentist lines might have been preferable over longer Paramount form to which Fields antics were shoehorned. Being PD, prints of The Dentist have been many and varied. TCM's from CineMuseum was the best I've yet seen. 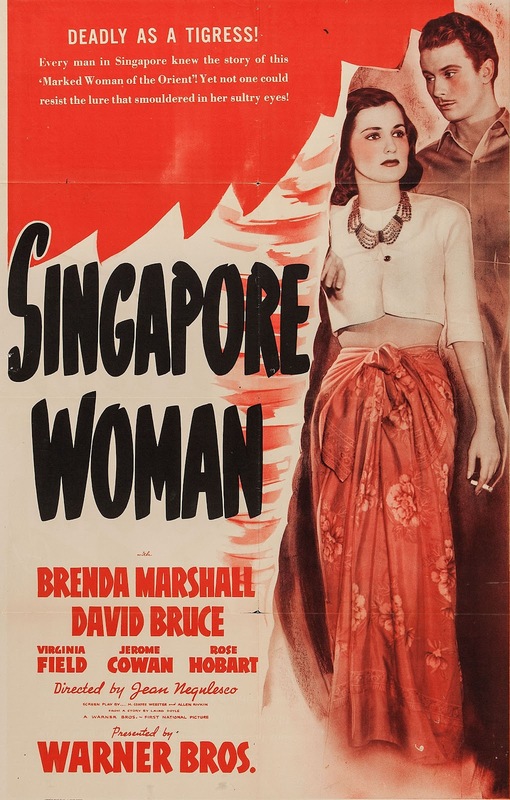 SINGAPORE WOMAN (1941) --- Director Jean Negulesco's first feature credit. He'd done, would continue doing, shorts with pizzazz rare to modest WB category. Singapore Woman borrowed story and sets from past Warner work, part Dangerous leavings here, jungle foliage from The Letter there. It was a B filled with aspirants toward better things, behind and in front of cameras. 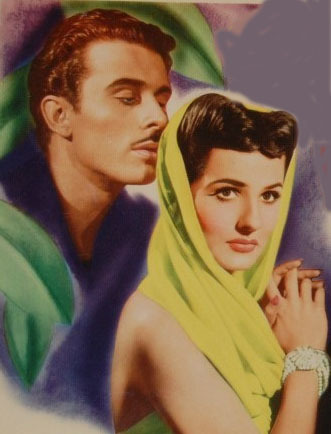 Brenda Marshall is a tropics tramp redeemed by David Bruce. She's dynamic, him less so. Neither would prosper as result of this. Sink-or-swim yarns, recycled to nubs and especially so at WB, could yet be overcome by hungry enough personnel who'd rise above it and prove worthy of promotion. Competition was keen at Warners, and not just among actors. Directors raced by way of old scripts they could upgrade and show off with. Negulesco was developing The Maltese Falcon around a same time as Singapore Woman, only John Huston snaked the assignment and greater laurels for re-making the twice-done mystery. Negulesco got eventual consolation when The Mask Of Dimitrios made Falcon-ish enough impression to put him in larger-budget class from there on. Singapore Woman shows tentative steps he took toward that goal. I really enjoy these thumbnail reviews, especially as we seem to gravitate toward many of the same films. I enjoyed both SINGAPORE WOMAN and SHADOW OF DOUBT in recent months so was glad to see the beautiful artwork you featured here! Yes, please keep up the vest pocket reviews! Some great ideas as to stuff to track down... am sure I saw SHADOW OF DOUBT some 40 years plus ago, must have missed it popping up in the WAC. The other Fields shorts were always hit or miss in a 16mm program in my experience, even when included in a classic comedy retrospective. Occasionally well received but many times all you'd hear was polite chuckles. THE DENTIST was guaranteed dynamite, however, always raising the roof from credits to end title.